To embrace the unexpected bumps and turns of life, is to embrace life itself. Who knows what wild and wonderful paths it has in store for us, so enjoy the detours, they might turn out to be our highways. This post was inspired by Ese’s shoot and quote challenge, ‘direction’. This entry was posted in change, mindfulness, nature photo, philosophy, photos, spiritual, stuckness, thoughts and tagged Carl Jung, change, growth, life, philosophy, photography, psychotherapy, purpose, quote, spiritual. Bookmark the permalink. My highs and lows are not so dramatic these days. This kind of life started out feeling a bit boring but now I don’t want to deal with the intensity of both. When things go ‘wrong’ I don’t fall down in a heap and I can stay on the right path. Same with the highs. They don’t derail me. Thank you. 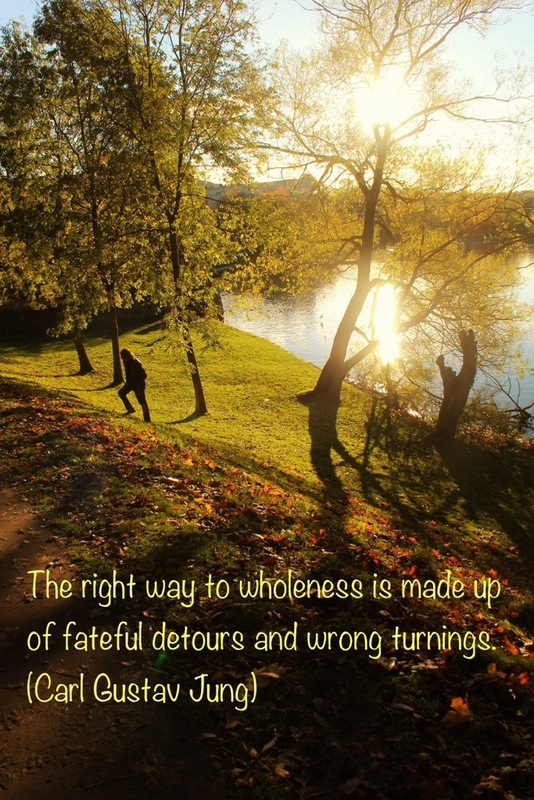 I can’t disagree – i think that all the wrong turns turn into not so wrong ones after all. And offer if not a new perspective to the things around then to ourselves at least. Gorgeous photo! Thank you very much for being a part of the challenge. and what when the turnings are wrong? Going backwards, and making wrong turns if we move on at some point are still considered as part of going forward? My dear you are a therapist and I value your insight, hence my question. Warm regards, P.
Paula my lovely, I think what Jung was getting at in this quote was that there really is no such thing as a wrong turn or a dead end…..everything which happens to us helps us understand ourselves a little better….and so we grow more whole. Mistakes might just be roads which were very uncomfortable, and down which we found out lots of things about ourselves which otherwise would never have been exposed. Becoming whole means embracing the light and the dark within us, the comfortable and the uncomfortable. Mistakes and steps backwards are just another part of the journey of growing into ourselves. 🙂 Can I give you a virtual hug? Everything is a chance to understand ourselves better! What a great quote and lovely photo. That’s a terrific quote and the image you’ve put with it works well. Life is often an uphill climb after taking a wrong turning. Lovely and so true but it can be hard sitting through it at times. That’s because we try to plan the details instead of keeping the overall destination in mind. I try to “go with the flow”, but don’t always succeed! Me too Doug, and like you I have varied degrees of success in going with the flow.